Saw this beauty recently at Sweetwater Creek State Park. With over 2,500 (mostly) wooded acres of space, this lovely site contains hiking (and running) trails, ruins of a Civil War era fabric mill, a 200 plus acre lake, and a beautiful stream side environment with lots of native plant materials. All of which segues me into the associated photo. 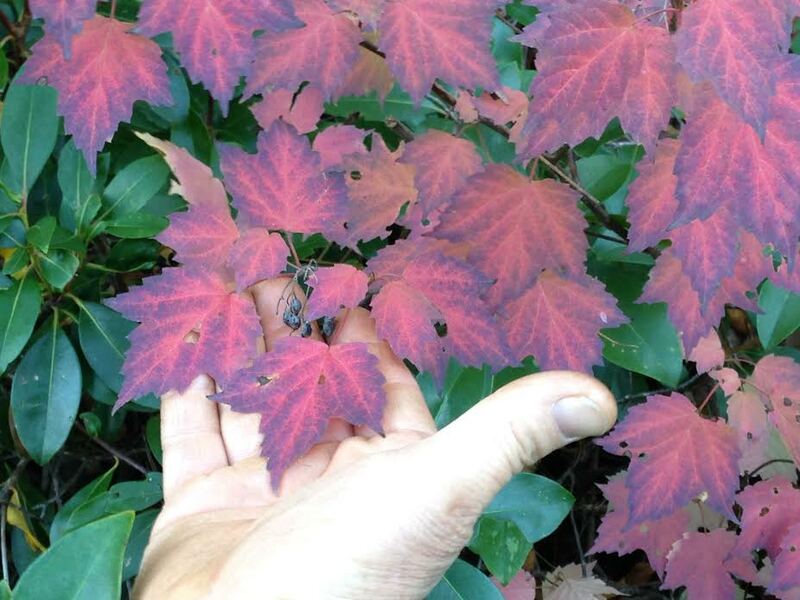 At first glance, this native shrub looks like a Maple tree, but it’s actually a Viburnum. (The blue-black fruit, barely noticeable in the photo at the tip of my fingers, is a giveaway as a Viburnum.) The botanical name is Viburnum acerifolium. As is usual in botanical names, the species name is descriptive of some aspect of the plant. In this case, “Acer” is the great genus for the Maple Family and, of course, “folium” refers to foliage or leaf. So, even though the leaves certainly look like a maple, the flower and fruits of this plant identify it as a Viburnum. Remember, boys and girls, plants are grouped into the same genus because of similarities in flower and fruit, not because of leaf appearance. This plant is extremely shade tolerant, spreading (colonizing) as an understory plant in drier soils. This is an excellent shrub growing to 4-6′ in height with wonderful fall colors of pink to rose to red to grape-juice purple. I’m not aware of any commercial sources, but it is a fairly common plant in our area and further north. It is easily propagated from woody cuttings in June to July. Please remember it is a big no-no to collect plants, etc. from the wild in our State and National Parks. Better to get permission from a private landowner who probably doesn’t know what the heck they have anyhoo.